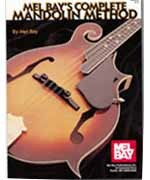 With the thoroughness of a book by Mel Bay, this method presents mandolin technique and note-reading in a progressive, step-by-step fashion. Given the diverse applications of this versatile instrument, this method was carefully written to build the musicianship and technique needed to play both classical and contemporary mandolin styles. Music theory concepts and additional playing techniques are introduced as needed. Exercises and tunes are presented in all keys, many in duet format to be played by teacher and student. In notation only.